It seemed all very “hush, hush and on the Q.T.” as I entered the untypically silent GoldenEar room. But TopEar Sandy Gross was smiling and with a wave of the hand indicated the DigitalAktiv3, a small, smooth, stand-mounted powered monitor that uses style and technology derived from GE’s Triton Reference, including the folded ribbon tweeter and 6” woofer (with a longer throw) and an inertially balanced passive radiator. Using Class AB power, the tweeter is assigned 60W, the woofer 200W. Though the speaker is still in prototype form, bass response is rated into the mid-40Hz region. Internally, there is a 56-bit DSP-controlled crossover plus optical and analog inputs, BT, and wireless connectivity via Google Chromecast, chosen says Gross, for its multizone capability and built-in voice command. Dual subwoofer outputs are provided, one of which is filter-matched with GE’s compact SuperSubX $1249 (review forthcoming). Due 4th quarter of 2018, projected price $2000. He’s baaaack! 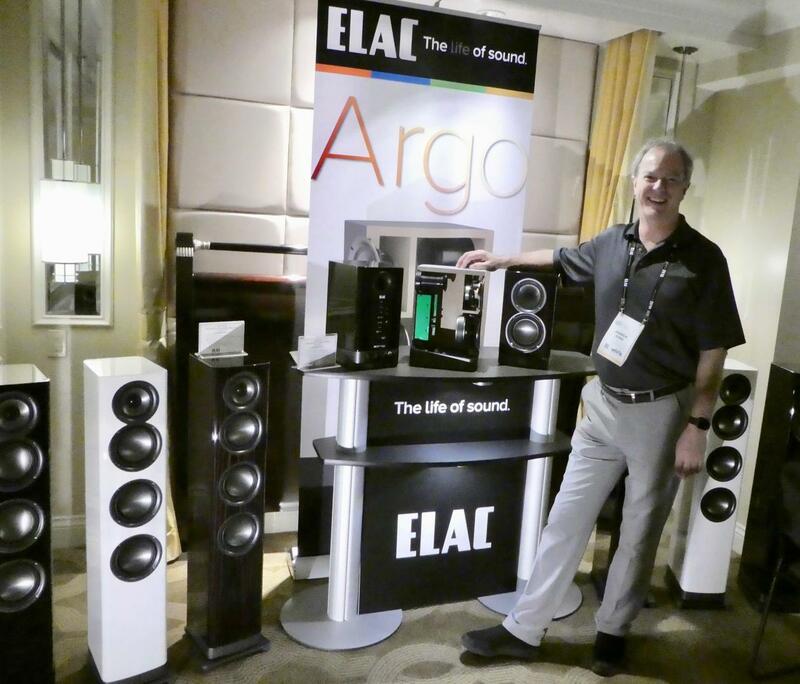 By that I mean Elac’s indefatigable Andrew Jones, who previewed the company’s Argo B51 bookshelf model and F51 floorstander ($2000 and $4000 respectively). Jones characterized them as “youth-oriented” designs. They are both three-ways and feature Elac’s customary coincident tweeter/midrange plus a 5.25” aluminum woofer (three in-line woofers in the case of the F51) in svelte, low-diffraction cabinets. Amplification is analog Class AB with each model powered by a total of 250W BASH power, split 30W/70W/150W between tweeter, midrange, and woofer(s). Inputs include balanced XLR, TSR, and RCA. A wireless input is designed for use with Elac’s Discovery Connect transmitter to stream Discovery, Spotify Connect, BT, Airplay, and Roon. Eschewing DSP, Jones pointed out it’s easier to attain transparency in the amp section than maintain it in the constantly shifting digital world. To that end he demo’d the near-production-ready B51 with the new Audio Alchemy by Elac DDP-2 streamer/DAC/preamp ($2500, May shipping). Its sonics were focused, capable of big band-level energy and output, and startling in intimacy, as the track “All My Trials” from Peter, Paul & Mary amply demonstrated. I was about to blow past the KLH room, figuring it was just another offshore entity cashing in on an iconic name. But the music filtering into the hallway was indeed alluring. I glanced in and thought I saw a ghost in the form of the classic and glorious Model Nine. I’ll let my colleague Jon Valin pick up the story from here in his report, but suffice to say the relaunch of KLH was not limited to a Model Nine reboot. In fact the new U.S. owners are also offering a spiffy range of aggressively priced floorstanders and compacts ranging in price from a modest $1298 for the three-way Kendall tower ($998 and $798 for the smaller towers), a pair of two-way compacts (at $548 and $378), plus center channels and subwoofers. Manufactured in China, quality and finish appeared excellent with ¾” MDF construction, woven Kevlar woofer diaphragms, and one-inch anodized aluminum tweeters. In my view, the sound of the Kendall tower was, in a word, very promising. In the Harman room, JBL provided one of my most jaw-dropping double-takes. Proudly wearing retro like a pair of flower-embroidered, bell-bottom denims the famously popular three-way L100 monitor (I owned one back in the day—heck, we all did) has returned, reincarnated as the L100 Classic at $4000. While the speaker is still fetching with its iconic white woofer cone and foam egg-crate grille (in the original color choices of blue, black, or hot orange), its tweeter has received the much needed ministrations of the Revel team with a titanium dome and modern magnet/motor engineering. 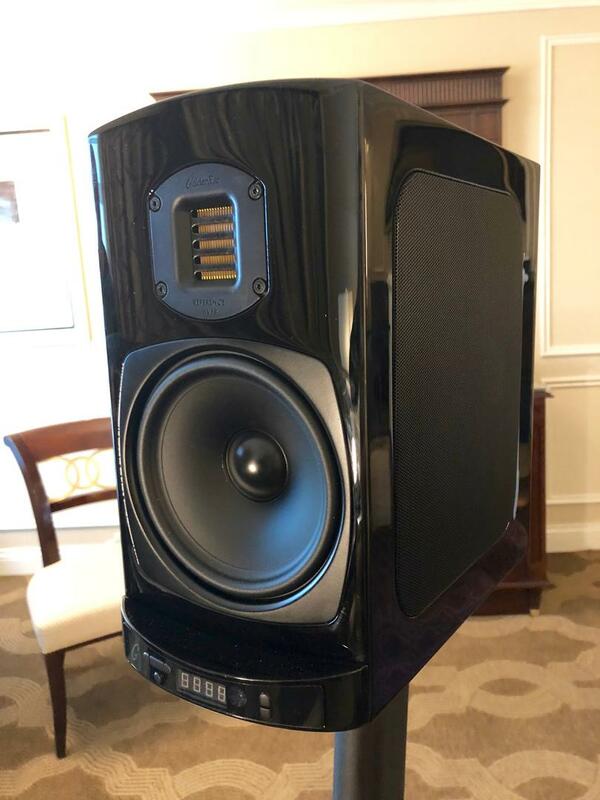 Turning to the Revel family, I got a listen to the Performa F228 Be floorstander ($10,000, see photo at top), a premium version of the F208 but heavily massaged with a beryllium tweeter, new anodized aluminum woofers. and crossover mods. Classic Revel sonic virtues prevailed—unflagging dynamics, balanced tonality, and hair-raising bass response. This could be the class-leading speaker of the year. Nearby was the M126 Be ($4000) a similarly hot-rodded iteration of the superb two-way M106 that I reviewed a while back. I’m anxious to take a pair out on the track soon. Due April. In the closing hours of the show I caught up with distributor Bluebird Music on the 35th floor and was glad I did. 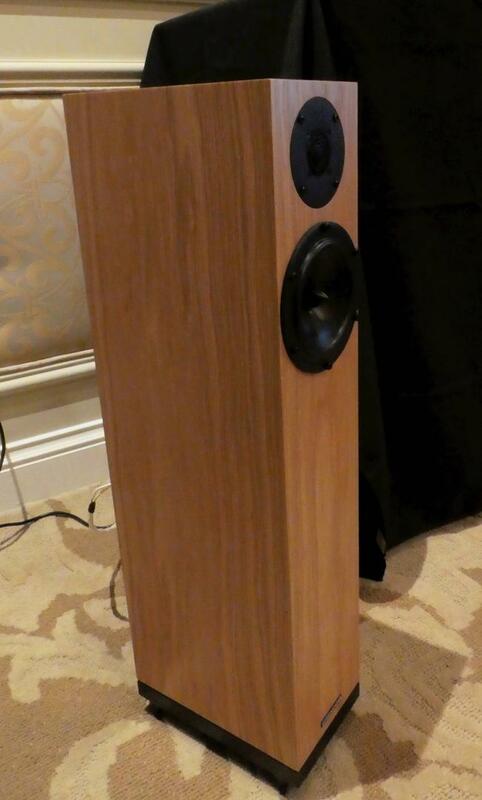 Borrowing engineering and styling cues from the Spendor D7 and D9, the A2 ($2395) and A4 ($3195) are short (29.7” and 31.3” respectively), small footprint, mini-tower two-ways. They are physically unobtrusive, ideal for the small apartment or den, but possessed of big voices. Each is outfitted with Spendor’s 22mm soft-dome tweeter. A 6” polymer cone woofer graces the A2, with a beefier 7” unit for the A4. They are ported in the rear. Spendor voices them to provide a more forgiving sound that suits a more modestly priced chain of electronics and sources and is less demanding of amplification. Sonics were rich and slightly dark on top, but Diana Krall’s version of “All or Nothing at All” was crisp, articulate, and nicely scaled. Available in oak, dark walnut, and black. To great effect, Totem Acoustic took the budget-minded system approach. Featuring Totem’s Signature One $2650, the modest rig ($7100 total) included the VPI Cliffwood table, Moon 240i integrated, Transparent Audio MusicWave/MusicLink and PowerBank 6 conditioner. Sonically Totem achieved a rare synergy of openness, resolution, and dynamics during show conditions that had me coming back for more (at least three times over the course of my two days of attendance). DeVore Fidelity Gibbon Super Nine produced loads of output, smooth tonal balance, and tons of value at its $9990 price point. 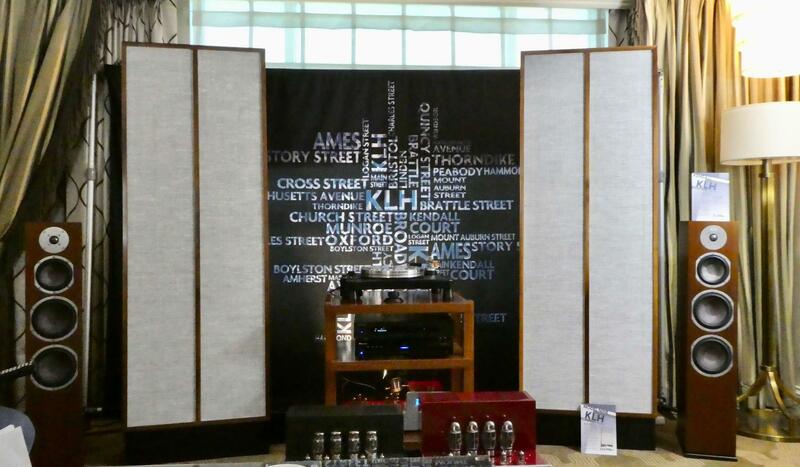 VTL’s TL5.5 preamp and MB-185 monoblock amplification encouraged the 37” tall, 91dB sensitivity, 2.5-way system to achieve a very nice, weighty, and full-bodied presentation with piano and doublebass. Most of us recall the Wilson Audio Duette Series 2 ($22,000 w/stands) as the Wilson compact designed for wall placement. I’ve always felt a little sorry for these two-ways that have stood in the shadow of Wilson’s mega-floorstanders. And truth be told, the earlier version seemed to be trying a bit too hard. But hearing this setup was like hearing them anew. The system demonstrated brilliant balance between output and dynamics while delivering a vivid and dimensional soundstage. Credit is certainly due the VTL TL-6.5 Series II Signature tube preamp and S-200 Signature Stereo amp for sonics that were warm, smooth, crisp, and quick, but never over-baked. The VTL and Wilson Audio team are no rookies when it comes to exhibition room setup and you could hear that experience with every note. Filling out this terrific setup was the VTL-2.5i phono preamp, Brinkmann Spyder deck with Lyra Etna cartridge, dSC Rossini player, Finite Element rack and Nordost cabling and conditioning. While the Vandersteen exhibit was focused on promoting its new monoblocks, they reminded the collective crowd that their mid-level loudspeaker, the $14,600 Quatro CT (hybrid design with powered woofer), is nothing to turn your nose up at. With help from ARC, AudioQuest, and Harmonic Resolution audio stands, dynamics were effortless on both the micro and macro spectrum, and the cabinet didn’t editorialize. It plainly vanished, eerie. And finally, a pair of “returning champions” continue to spice up the drama in the brawling $10k segment. Sporting similar specs was the Technics SB-G90, and the Paradigm Persona 3F. Both stand about 44” tall and are four-driver, three-way towers. Each has the sonic swagger of a near-full-range flagship but at reasonable prices. 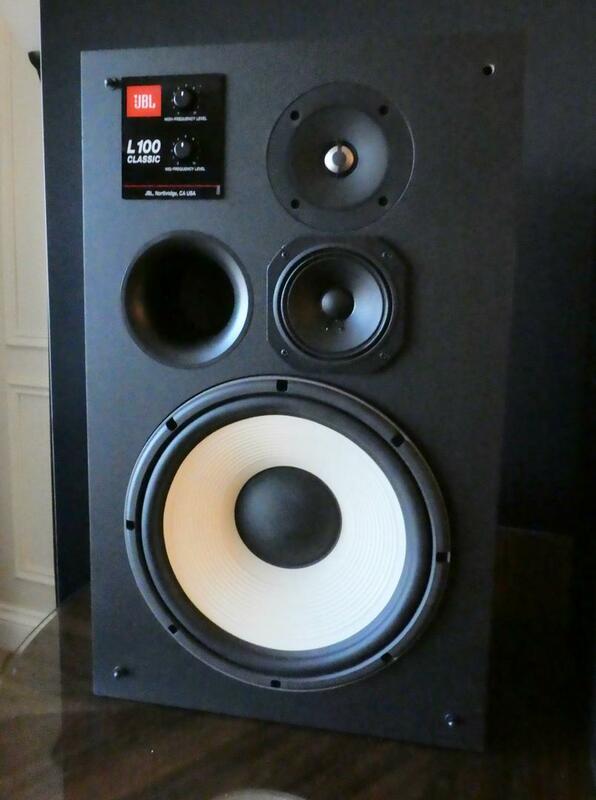 I’d love to get these and the Revel F228 Be in the same room and see what happens! Best Sound (Cost No Object): There were larger and more expensive demos on hand but I personally related to the musical qualities and transparency found in the VTL/Wilson Audio/dCS/Brinkmann exhibit. It may have lacked the grand scale but its low-level intimacy was addictive. Best Sound (For the Money): The Elac Argo B51 powered compact and Alchemy by Elac DDP-2 streamer/DAC/preamp—a complete system for under $4500 (just add interconnects)—was the embodiment of great audio on the cheap.